Location: Approximately 43 kilometers south of Limon to the town of Cahuita. Highlights: Scuba and snorkeling, white sand beaches, coral reefs, turtle nesting, scenic trail between ranger stations. Facilities: Two ranger stations—Kelly Creek Station, Puerto Vargas Station—are open from 8am to 4pm and have potable water & restrooms. The beach camping area has restrooms, showers and picnic tables. Swimming is allowed only in the camping area due to protected turtle nesting areas and strong currents. Scuba diving is a popular activity in Cahuita National Park. Beautiful coral reefs and very colorful tropical fish offer make this a diver's paradise. There is a shipwreck located at the north of the mouth of the Perezoso river that sank in the 18th century. 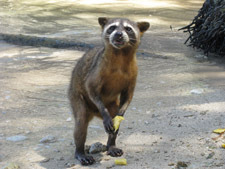 On land expect to find raccoons, pacas, sloths, agoutis, crabs, howler and capuchin monkeys, night herons and keel-billed toucans, coatis, and snakes to name a few. The southern beach is a nesting site for several varieties of sea turtles. There is a scenic trail from the Kelly Creek Station along the coast to the beach camping area which also has restrooms, showers and picnic tables.